I love using leftovers to make a great lunch. When I went grocery shopping on Sunday, I intentionally bought more salmon than I would need so that I would have leftovers to play with. Last night, I made grilled salmon and grilled asparagus – I had a little piece of salmon and 2 pieces of asparagus left. 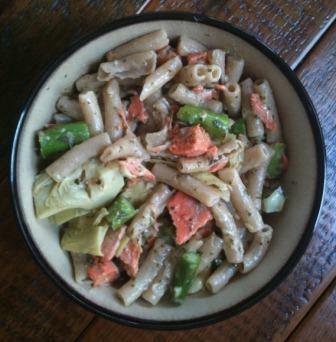 Today, I chopped up the asparagus and salmon into chunks. I also quartered 3 artichoke hearts. I then cooked some organic brown rice pasta noodles. While that was cooking, I quickly sauteed the salmon, asparagus and artichoke in a small frying pan with 1 tablespoon of basil pesto. After I drained the cooked pasta, I added it back to the pot, threw in the salmon, asparagus, artichoke, pesto mixture, added a sprinkle of parmesan cheese. I mixed this up and put it in a bowl for a great lunch. This took me about 7 minutes start – finish and required me to wash 4 dishes. Not bad!